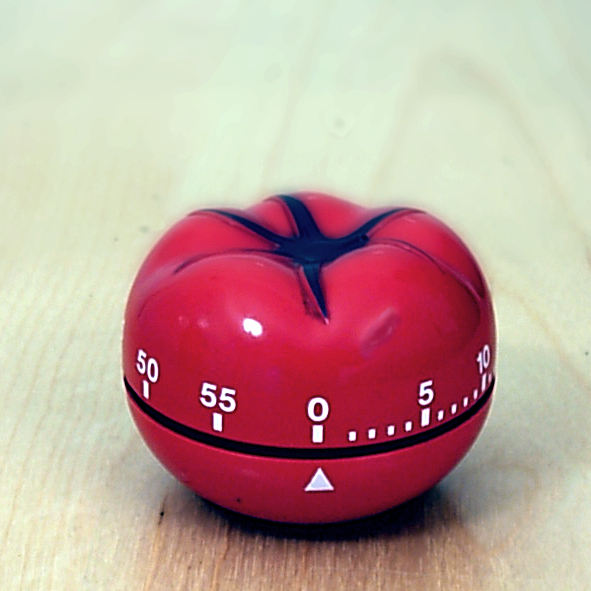 You work for 25 minutes straight on one task; this is one pomodoro. If you are interrupted, you deal with the interruption and start over – there are no partial pomodoros, so you have to discard the one in progress. After a 25 minute work period, you take a 5 minute break. Really – you are not allowed to keep working. Check email, look over your task list, whatever. I find it’s a good time to get up and walk around and shift my visual attention so I’m not constantly staring at a screen. After 4 pomodoros, you are permitted a longer (15-30 minute) break. For an added layer of complexity you can estimate how many pomodoros each task will take, and then compare it to how many it actually takes. This is a good way to train yourself to more accurately estimate task complexity. I like this technique for a few reasons. It forces me to take breaks, walk around, stretch and otherwise avoid melting into my chair for 8 hours at a time. It forces me to break down complex tasks into small, manageable chunks. If I can’t complete a task in a few pomodoros, it’s probably too big. It lets me track my productivity over time. It’s easy to say that I was constantly interrupted on Monday, but it’s easier to quantify if I can show that I only got 6 pomodoros done instead of my normal 10-12. My problem with this technique is that it takes too long to get back into the coding mindset after a break. Some estimate it takes between 10-15 minutes to resume coding after an interruption; if you are interrupted by a break every 25 minutes, you’re not going to get much accomplished on a complicated piece of code. I sometimes find the break comes at an inopportune time, when I’m just on the verge of finishing something. I usually have to quickly dump some thoughts into the file I’m editing as to what I was doing and what my next step was. Do you use the pomodoro technique while programming? If so, do you find the recommended 25/5 breakdown sufficient for getting work done? Do you increase it, decrease it? E.B. 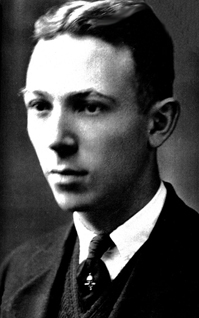 White, the children’s book author of Charlotte’s Web, wrote a letter explaining how fan mail had become his enemy – it sapped all of his time and prevented him from writing new creative works. Substitute email for fan mail, and you get an almost perfect description of the problems many office workers face. I’ll describe some of these problems and strategies for solving them. All of the following quotes come from the letter, followed by my thoughts. I would like to write another book for children but I spend all my spare time just answering the letters I get from children about the books I have already written. The result is the author swamped with mail. Letters now come to me faster than I can answer them. Many of the letters contain requests—for an autograph, for a dust jacket, for an explanation, for a photograph. This to me presents a real problem. I have no secretary here at home, and if I am to deal with my mail I must do it myself; if I am to mail a book I must find the wrapping paper, the string, the energy, the right amount of stamps, and take the parcel to the post office up the road. This can occupy a whole morning, and often does. This problem still exists, as message senders do not consider all the other requests vying for the attention of the recipient. I’ve heard of a few ideas to combat this, like the now defunct Smoke Signal, and Courteous.ly, which both aim to indicate to the sender how much email the recipient has in his inbox. About four years ago, I had an idea for a story for children. It seemed like such a pleasant idea that I spent my spare time for several weeks doing research and making notes—the raw material of a book. I put everything in a folder and there it still lies, awaiting a spell when I feel enough caught up with life to tackle the writing. Every once in a while I take this folder out and examine it, hungrily. But then I look at my desk where the unanswered letters and the undone things lie in accusing piles, and I stick the folder back in its corner. I relate to this a distressing amount. I find it very difficult to ignore requests that come into my inbox, and as a result spend a large portion of time reading and responding to emails instead of actually accomplishing the things that are on my list. I try to mitigate this problem in a few ways. I’ve written previously on ways to deal with information overload, including including shutting off any sort of email alerts (sounds, growl notifications, etc). I turn off all push notifications on my phone, and I do not link my phone to my work email account. This keeps email a ‘pull’ sort of system which I can read at my leisure rather than a ‘push’ system. I try not to leave a tab open, and instead open my inbox only a few times a day. I use Priority Inbox in Gmail and it does a remarkably good job of classifying emails as important or not. I set up additional filters so that, in general, only mail which directly includes me on the ‘to’ line makes it into my Important box. I try to keep the Starred and Everything Else sections minimized or hidden so that those streams of messages do not distract me from the important ones at the top of my inbox. Despite what I mention above, I still check my email too frequently, and I still get too much email. I have a tendency to want to reply immediately to questions that come my way, even if it’s to a group of people and not directly addressed to me. This is a Very Bad Thing, because it conditions people to expect an immediate response from you, and reinforces the sender’s notion that their request really was urgent. I’m trying to learn to sit on my hands for the emails I see that are 1) addressed to more than just me and 2) don’t seem urgent. That way it gives others a chance to chime in and hopefully resolve the issue without my involvement. Some products that implement the ability to ignore a message for a set amount of time are Snooze Your Email for Gmail and Boomerang for Gmail. I personally use a small Google Apps Script, so I can’t vouch for those two products. E.B. White describes the problems that excessive fan mail caused him. I see very similar problems every workday dealing with email. It’s dangerous to get in the habit of answering each request, no matter how small. It is distracting. The messages are likely to be about many different topics, causing context shifts and interrupting flow. Answering quickly reinforces the notion that the person making the request was right to consider the request as urgent. Answering emails tends to lead to receiving more email. You can feel a false sense of accomplishment by responding to emails, at the expense of doing your real work. Some celebrities like Ringo Starr and Thomas Wilson choose to handle the problem of excessive fan mail by refusing to open any of it. Most of us cannot get away with that approach for email, but there is a middle ground we should take between that extreme and the extreme of obsessively answering each request as soon as it comes in. There are mitigating strategies you can use to prevent emails from dominating your time and creativity. These include removing notifications, filtering your inbox, and snoozing non-urgent mails. For many other techniques you can read Merlin Mann’s 43 folders site. Do you use Google Chrome? Do you sometimes want to close multiple tabs at once? Here are three ways to do that, two of which are not immediately obvious. When you open links in a new tab, it will open immediately to the right of the tab you’re currently in. Thus if you have opened a few tangentially related tabs from a main article, you can click on the main article’s tabs, choose Close Tabs to the Right, and all of those newly opened tabs will go away. You can add tabs to the current selection by holding control (Windows/Linux) or command (OSX) while clicking on additional tabs. This is exactly the same behavior as when you are selecting multiple files from the desktop GUI. Once you have the tabs you want to close selected, you can right click on any one of the selected tabs and choose “Close Tabs.” This approach works better than the “Close Tabs to the Right” approach when the tabs you want to close are not all next to each other. Why might you want to do this rather than clicking the X in each tab individually? I can think of two main reasons. The second reason you might use this method is that it allows you to make your selections all at once before closing any one of them. If you close them one at a time, the tabs move around to take up the empty space. The Chrome team has done an amazing team with the UI design of the standard close tab functionality (e.g. the close button will always stay under your mouse cursor as the tabs reshuffle, and they only will change size once your cursor leaves the tab bar), but it might still be more intuitive to select them all at once while their location is fixed rather than finding them in the changing tab bar as each consecutive tab is closed. See this excellent blog post by Basil Safwat for more on the Chrome tab close behavior. Once you have your selection, you can right click on any of them and choose Close Tabs as mentioned earlier. This approach is best when you have a contiguous span of tabs you want to close, but there are some tabs to the right that you want to keep open. I hope you found this brief foray into the ways of closing multiple tabs in Chrome as interesting. I think most Chrome users know of the Close Tabs to the Right option, but I would guess most people don’t know about about the shift click and ctrl/command click ways of selecting tabs. 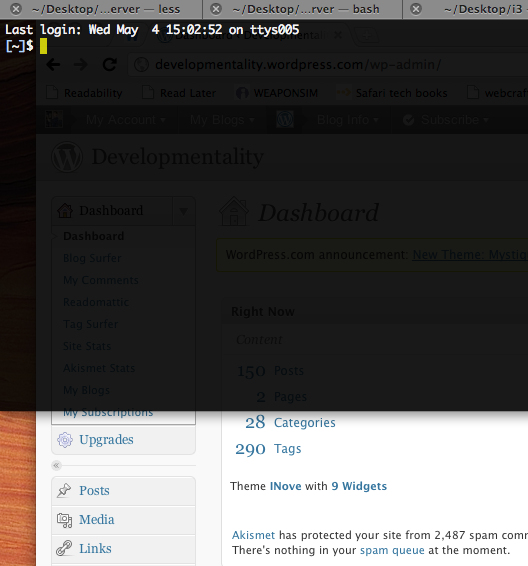 My friend Paul showed me a very nice application to quickly launch Terminal. It’s called Visor, and it’s very useful if you’re a programmer. After installing it, your terminal hides until being summoned via a keyboard hotkey. At that point, it pops into view from the top of the screen (though this can be customized if you desire). I find it really declutters my desktop, as I no longer need to devote screen real estate to the terminal. Instead, it’s hidden until I need it. Due to the way it’s packaged (as a SIMBL plugin that modifies the Terminal app itself), it is unobtrusive, incorporating its settings into the Terminal app itself as opposed to requiring a separate app in your dock or quick launch bar. It’s simple and works flawlessly. Can’t ask for much more in a piece of free software. While our desktop computers excel at multitasking due to their multiple cores, the human mind fares much worse. There have been multiple studies showing that multitasking can impair productivity. Often the reasoning is that the brain requires time to adjust between different tasks, due to the switch in context. An analogy for this would be driving on a highway. You’re going to cover a lot more ground in the same amount of time if you can keep a constant speed (focusing on one task) rather than having to constantly take exits and switch to new roads (tasks). While those who multitask frequently might think that switching tasks bears no greater cost to them than switching lanes on the highway, the studies suggest that the cost in focus and time in switching to the new task is more akin to having to take that offramp, find a new highway, and then get back up to speed. But enough about metaphors and science. I am not a cognitive scientist so I’ll leave that up to the people who do it best. I can only speak for myself, and I find that it’s supremely tempting to pick away at pieces of problems rather than to focus on one thing and make significant progress in that regard. I also know that I am objectively less productive if I constantly am switching tasks. It is for that reason that I’ve assembled a set of tools that allow me to have a stronger single-minded focus while working on a computer. While there are systems such as Getting Things Done and the Pomodoro Technique which address the human aspect, I’m going to be focusing more on technological solutions with respect to working on an Apple computer. While many criticize the iPhone and iPad for their limited multitasking support, I think having full-screen applications and focusing on one thing at a time is very beneficial. With that thought in mind, the rest of this post will show various ways to make the Mac less suitable for multitasking and closer to the iPhone/iPad model of computing. Gain more desktop real estate. Eliminate the visual clutter at bottom of the screen. Right click on a portion of the dock which does not have an icon, e.g. on the portion where the dock can be resized. I love the ability to open multiple webpages in a single browser. It can be supremely useful when you are researching and need to have multiple pages open to reference. Unfortunately it can also lead to shallow reading and a mild form of A.D.D. wherein the user (i.e. me) keeps opening new links with the intention of reading them later. There is seemingly no cost to opening a link in a new tab, but it does exert a cost – it makes it harder to find the tabs that are actually relevant, and it also uses more system memory. There is a discussion on the Firefox feature request group to limit the number of tabs that one can open at a time, for reasons similar to what I have presented above. The best solution given is to install a TabCounter extension in FireFox which shows how many tabs you have open. It still requires you to monitor the number and prune the number of tabs when things get too bogged down, but it’s better than nothing. For those using Chrome, there is a Tabs Counter plugin which performs the same task. My desktop inevitably is the dumping place for miscellaneous junk. I’d rather just keep it out of sight and search with a program than keep it organized and visually scan through them for what I’m looking for. Computers are a lot better at search than humans; let’s take advantage of that. The icons on the desktop do nothing more than distract me. I use Camouflage on both my home and work Mac. I was happy to see that Windows 7 allows you to hide the desktop icons without installing an additional program. Eliminate distractions by de-emphasizing the elements on the screen that are not important. For the time you are not actively attending to the menu, make it less visually important. I use MenuEclipse on both my work and home computer. It’s not a life changing application but it does what it sets out to do. There are some obvious exceptions to this; for instance it is often extremely convenient to have both a calendar program and e-mail program open side by side when scheduling things, or having a web browser next to your programming environment for web search results. There are other times in which such extra programs are a distraction; in this case having a single program as the focal point can allow you to focus. O different interface than Doodim – you have to explicitly choose a new window to focus on via an interface similar to the standard task switcher, rather than being able to shift the focused window by clicking on other windows. The final piece in reducing distractions and improving single-minded focus is to remove the interruptions that our installed programs produce. If you’re unfamiliar with Growl, it’s a program which ” lets Mac OS X applications unintrusively tell you when things happen. ” While it is a lot less intrusive than a traditional modal popup window, it still can be distracting. The first thing you should do is close the programs that are creating the popups in the first place, but you might want the program to run, just not keep interrupting you. I personally haven’t taken this step, but you can remove Growl if you find it too distracting. Instructions are here. While dealing with e-mail is a whole different issue, the least we can do is make sure that each pebble falls silently into the inbox rather than calling attention to itself. This post was started long before Apple’s announcement of its new operating system, Lion, but it was not surprising to me that Apple is going to make OSX work more like iOS, with the addition of full screen applications and an app store. I don’t want the Mac to become exactly like a giant iPhone or iPad, and I certainly wouldn’t want every application to be full screen. However, there are times when I need to focus, and by making the computer less capable, it makes me more. I love technology. I especially love discovering and using technology that makes me more productive. I’m writing about a piece of software called Synergy that allows you to use one mouse and keyboard to control multiple computers, each of which may be running different operating systems. In my case, my primary display is for my Mac, and a secondary display off to the right is connected to a Windows PC. Previously, any time I needed to use the Windows machine I had to unplug the USB cable powering the keyboard/mouse combo and physically plug it into the windows machine. (Alternatively I could have bought an extra keyboard and mouse and had to juggle with the physical hardware.) If I needed to transfer text (e.g. a sourcecode snippet) from one machine to the other, I would have to resort to shuttling files or e-mailing it to myself. By using Synergy, the mouse no longer stops at the right edge of my Mac display. Instead, the cursor continues to move to the right, onto the Windows desktop. Suddenly both your mouse and keyboard control the PC. If you copy text from a file on Windows and revert to controlling the Mac by moving the cursor back to the left, the text is in your Mac clipboard. Pasting is limited to plain text (e.g. you can’t copy an image from one computer to the other). You can’t drag and drop files between the screens (this would be awesome); instead best workaround I can find is to have a networked folder accessible to both computers and use it as a dropbox to ferry around files. It’s a bit kludgy but it works. Finally, there’s a bit of work you need to do to get it to work on windows vista/ 7 – see here for the details. 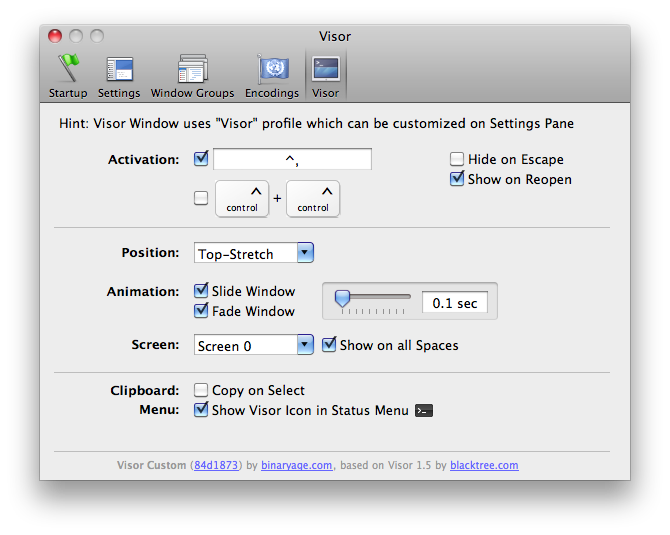 This is a really great piece of free software, and it allows me to do my job more effectively. I hope you find it useful as well. Well, it’s almost February so the New Year’s Resolution rush has probably gone by. If you’re anything like me, there are a lot of things you would like to do, habits to get into, but that you can’t really find the time or energy to keep them up. I stumbled upon a website that promises to help you meet and sustain your goals – habitforge.com. The premise of the site is simple: it takes 21 days to make a habit stick (despite that often-quoted number, the science might not be there to back it up). Regardless, you enter in your goal and the site e-mails you each day to determine whether or not you met your goal during the past day. It keeps a counter of the number of consecutive ‘yes’ days, as well as statistics on your overall success, failure, and non-response rates. If you miss a day, the counter goes back to zero. I like the site for two main reasons. The first is that it has a pull rather than a push mechanism for receiving your responses. I don’t have to remember to log into the site and enter my information (push); as long as I check my e-mail daily, it actively solicits a yes or no response taking no more than one click. The second reason I like the site is that it actually seems to be working – it’s fun to see the dots of progress for consecutive completed days fill up, and it’s very painful to see them reset back to zero if you miss a day. I certainly have been writing a lot more than I would have otherwise had it not been for the reminders of the site. The site’s not perfect; right now there is no way to indicate that a goal only applies to specific days of the week (e.g. goals that are related to work habits probably don’t mean much on weekends), but the site promises that feature is coming. My second complaint is that if you forget to respond to the e-mail, it counts that as a no-response and resets the timers back to zero. Fortunately, there is a way to go back and edit past responses to fill in the missed e-mail solicitation; this puts the counters back to their rightful place. Until I found that option, I was a bit pissed at that idea; to me a lack of a data point should not be equivalent with a no or yes answer; it should keep the counter at what it is and just update the yes, no, no-response rate statistics. The idea of doing a task on consecutive days to improve at it and make it a habit is not a new thing; Jerry Seinfeld credits a similar system with helping him be so prolific and productive, though the method is a bit lower tech. I personally really enjoy this service, and hope it can be of some use to you too.